"That's TV" is a brand new TV network for the UK that first launched in the South of England in the fourth quarter of 2014. That's TV is designed to emulate the most popular local TV news format in the US and bring it to the UK in the form of live sports, phone-ins and entertainment. Every That's TV affiliate provides its own local programmes for the area in which it operates, and the That's TV Network has already been awarded exclusive licences to operate local TV in Oxford, the Solent, Basingstoke, Reading, Guildford and Salisbury, which together comprise one of the most demographically desirable regions for local programming and associated advertising in the UK. 'That's Solent' was the first of those local That's TV stations to launch, in November 2014, to be followed closely by 'That's Oxford' in January 2015. 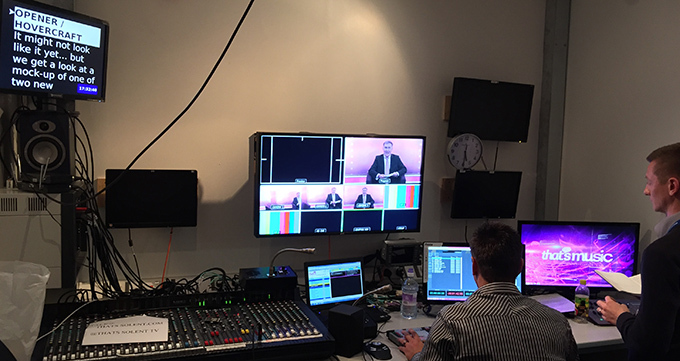 That's Solent is based in studios at Highbury College, Portsmouth, and provides coverage for Southampton, the Isle of Wight and Portsmouth with more than three hours of live news programming each weekday evening. That's Solent went live on the evening of 26th November, and began their news output the following day, but our involvement began less than a week earlier with a tentative enquiry about prompting equipment. The issue was that the news team, led by News Editor Charlotte Briere-Edney, was faced with producing more than three hours of live news output each evening, but early attempts to achieve that without robust and reliable full-scale newsroom computer system (NRCS) functionality, providing a full range of multi-user newsroom production, administration and management tools, had proved frustrating. 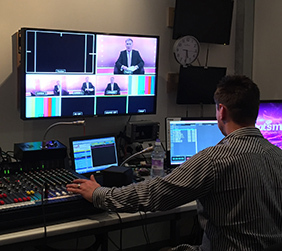 Although a standaloneprompting system initially seemed to be the answer, a more comprehensive, dynamic news automation system tied to the prompting is what actually provided a demonstrable, and highly visible impact on That's Solent's ability to deliver a high quality, professional news programme. The beauty, for both parties, was that within 48 hours of that initial telephone call, we had installed our newsroom computer system - QNews, , including database hardware and easy-to-use, highly configurable client software that established a smooth workflow and enabled full rehearsals of That's Solent to begin immediately and effectively. For the first time with only days before going live, all of the news team were able to fully collaborate. The same running order and program timing information was quickly and accurately available for the editor; script updates were available instantly on the teleprompter for the presenter to read; scripts and rundowns could be easily printed whenever needed; video clips could be selected for playback from the automation system; and graphics could be entered as part of the script production process. QNews' unique multi-column script layout, which can be set to follow the prompt position as the presenter is reading from it, provided a huge benefit for the Technical Director, as he was able to see both the script and corresponding director's instructions in real-time during the live show, and the customisable layouts enabled Charlotte to define a screen appearance exactly suited to her team's workflow. 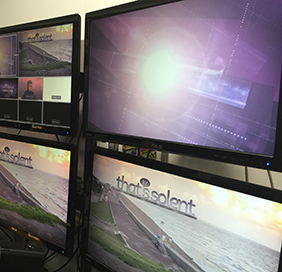 It was exciting to be involved with That's Solent's launch, and I'm delighted that we were able to provide a system that made the production process far easier than it would have been. We've invested a lot of time, effort and expertise in QNews over the years and it's hugely satisfying to see it realised as a mature product. We couldn't have done it without customer input, which we take very seriously indeed. Our customers include national broadcasters, regional TV stations and universities and colleges, and our software is now in use at hundreds of sites by thousands of users over the last fifteen years, and we continue to rely on their input to help shape how the products develop. The input provided by That's Solent is no exception. They contributed greatly to the success of the project, in which of course they had a vested and quite immediate interest! We configured their software to work in exactly the way they needed it to work and got them up and running within 48 hours of the initial conversation.